As a great novelty of the 2018 range, the Realm series marks a real turning point for the American manufacturer who moves away from fishing to better conquer families. 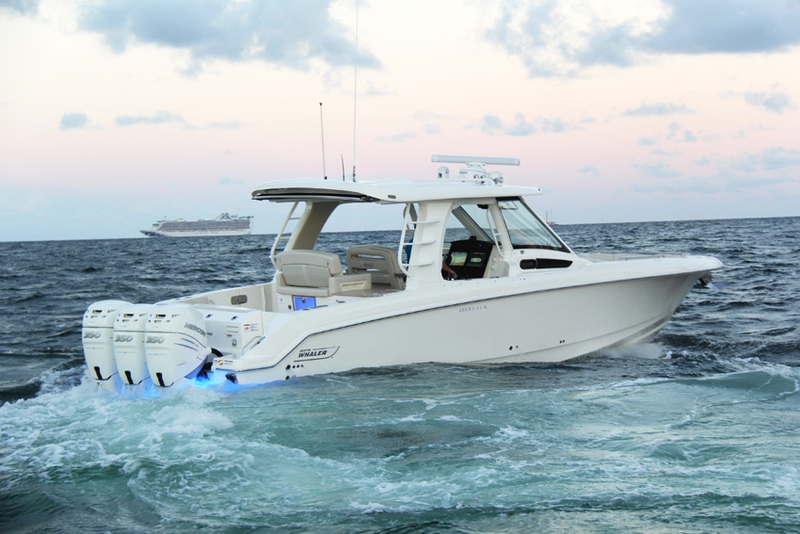 First in the series, the Boston Whaler 350 Realm offers many surprises. Anyone who still thinks that Boston Whaler only produces fishing boats will have to change his mind forever. 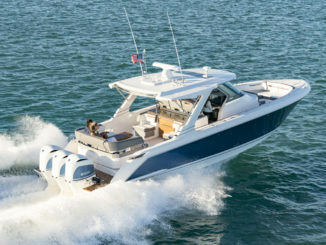 After the Vantage series, which is already very much geared toward day-to-day family entertainment, the Realm range takes the Florida shipyard to a whole new level. Indeed, the Realm 350 is a true crossover, a mix between an Outrage and a Conquest with a pinch of the Vantage. 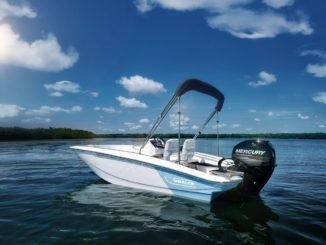 Aesthetically, the boat keeps the Boston Whaler inspiration as much in the style of the hull as in the design of the hardtop. Relatively impressive with 35’6’’ of length, the 350 Realm also has a width of 3.30 m, which guarantees good interior livability. Like all the boats of the brand, it has a high bow ready to defy the elements which is particularly protective for the passengers. The freeboard is also quite important (32’’) but it also offers a lateral door, which is very convenient to access on board, to swim or to pull up a nice catch. The access on board can also be done through the back platform and the gate. 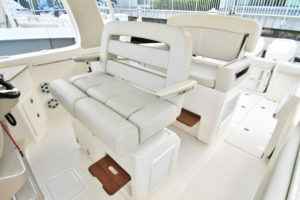 Once on board, the 350 Realm first offers an almost conventional cockpit in view of other models of the brand. 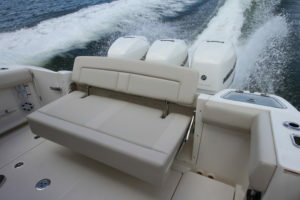 Large enough, this space has a good freeboard with cushions to support maximum comfort that fishermen will appreciate. There are also supports for fishing rods and even a live well. The floor hides a large technical compartment and two fish compartments. Under the hood of the central storage, housing is provided for the teak table. Well done! 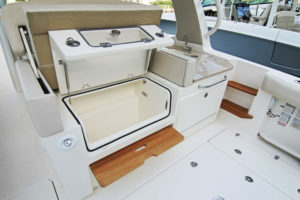 However, the Realm does not claim to be a fishing boat and, next to its fishing facilities, there is also a folding bench in the transom under which the bath ladder is cleverly tidied up. Just in front, there is a large block with a cooler (accessible in two ways) and surmounted by a comfortable bench. Another surprise is on the starboard side. A counter hosts a sink while a part of the surface pivots to give access to a grill while maintaining its functional work plan! So, with the unfolded transom seat and table set up, the cockpit immediately takes on a more family-friendly air. The exploration continues on the port side passage (20’’) with a wide bench that can be transformed into a lounge area by rotating the pilot bench away from the Hard Top. Finally, continuing its path, we arrive at a comfortable front lounge consisting of a double seat “lounge” with armrests and cup holders. Another double seat on the bow faces it and a table completes the whole. We can, of course, turn everything into a comfortable solarium for two or three people and as a bonus the seats conceal storage. 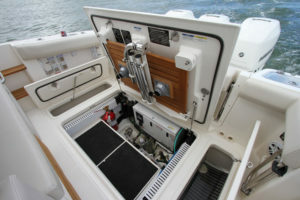 In the center of the boat, shifted to starboard, the cockpit is once again a model of its kind with good ergonomics (for example, the two-leveled footrest), and a suitable location for each element. You can install two large electronic screens, which will not interfere with access to the switches, located just below the cap. The throttle is also really accessible and the joystick is ideally placed on the right. The whole is protected behind a wide windshield and kept under the hardtop. The last detail is a cooler, housed on the side and therefore easily accessible. Although the layout is opulent, traffic remains fluid and a family can easily move around on this deck. If the layout is perfect for day cruising, do not believe that the Realm is a simple day boat because it also hides an amazing cabin. It is accessible through the sliding door to the left of the cockpit and from the first steps, we change almost completely universe. Welcomed by wooden furniture on the port side, the eye is then attracted to the couch that can seat five to six people and can turn into a double bed of good size. Natural lighting is provided by deck hatches and portholes while LEDs illuminate the cabin with advantage once night falls. On the port side, a real bathroom with a toilet, sink, shower and nice headroom keeps the crew clean. The only regret is that there is no mid-cabin, but it’s difficult to fit everything within 35 feet. 1050 hp and 52 mph! Well made and very well laid out, the boat logically displays significant weight (more than 13,200 Lbs empty). 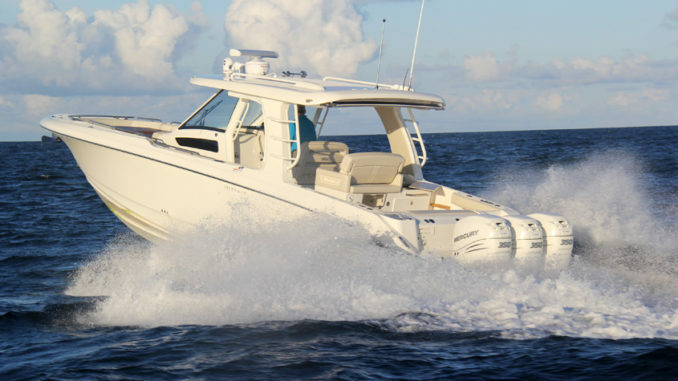 To mitigate this, the shipyard offers the boat with a triple engine in 3 x 300 or 3 x 350 hp. It may seem like a lot, but it is quite appropriate, as evidenced by the planing time done in just over 8 seconds, a logical result for the size of the ship. The cruising speed is around 35 mph, which already makes it possible to take a long trip. 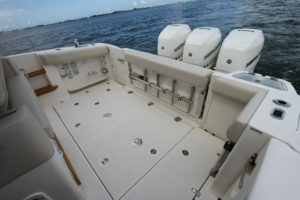 For speed lovers, the boat is also capable of reaching 52 mph. Again, it is more than enough. 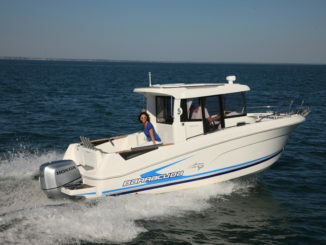 What is more, it is not the performance that is most impressive about this boat, it is especially its ease on the sea. Ignoring the choppy waters, the 350 Realm literally traces its path, splitting the wave with its bow at 23 °. Well supported on its bilges, it provides a real feeling of security and even offers very good comfort during the navigation. In addition, although it measures more than 35’ in length, its maneuverability remains excellent, thanks to the joystick. 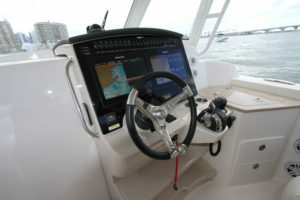 Its driving does not require a lot of pilot experience, just a little attention in the marina. 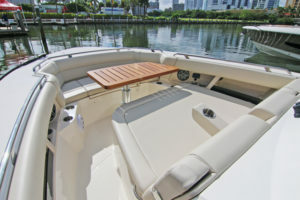 In short, the 350 Realm is a boat really thought of for the family and for the pleasure of being on the water.